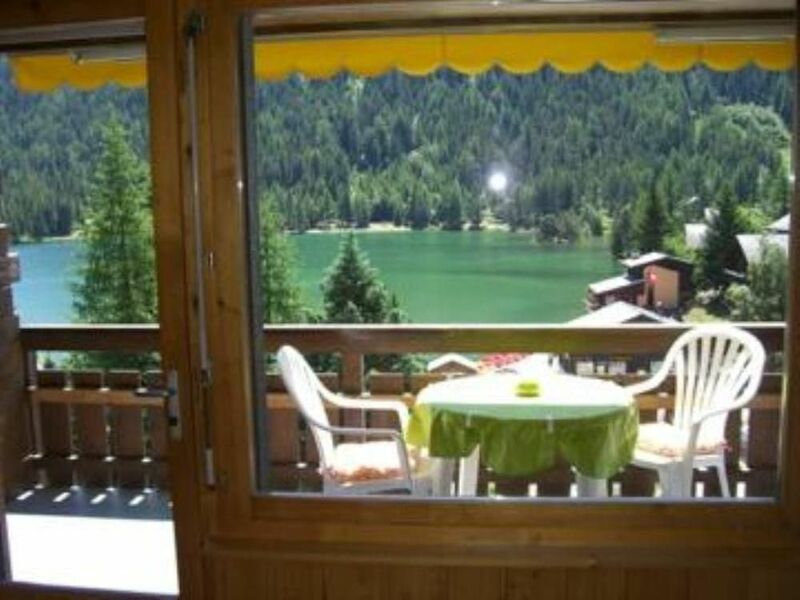 (Text automatically translated) Located in the heart of the pretty resort of Champex-Lac. At 25 min from the famous ski resort of Verbier (600 km of slopes). The view of Lake Champex is absolutely beautiful! The apartment is very bright. Large sunny balcony (8 m2) and private parking space in the garage. Fully equipped with TV with 30 channels, DVD player, coffee maker, raclette and fondue ... Direct access into the bedroom from the front door! In winter: beautiful ski background, several snowshoe trails, ice rink and two ski facilities ideal for beginners / children. At the heart of the Valais Alps. Summer: Champex has a beautiful botanical garden and beautiful pedestrian excursions. The lifts are open during the summer for lovely walks to the cabin Orny or Trient hut. Located 25 minutes from the large ski area of ? ?Verbier 4 Valleys). I rarely fall in love with places and immediately plan to return, but this place is one of those rare exceptions. In one word - lovable. We didn't do much, very little hiking and a lot of relaxation on the balcony, in the sun, with a nice book or a delicious pastry. The view speaks for itself, the atmosphere is pure and tranquil, the apartment has everything you might need. We cooked in a lot (my husband and I were there with our little child) - the supermarket is just across the road, very convenient. The Wi-Fi access is only on the balcony, the washing machine is on the ground floor and the bedroom can get stuffy if you shut the door, but despite these little things, I can't wait to return. Thank you to the owners for making everything from booking to departure nice and smooth. "My husband and I found the accommodation as advertised. The view was awesome -- looking out at the lake and the surrounding mountains. The apartment,though spare in furnishings, provided everything we needed. The bath and kitchen were modern and fully equipped. It should be noted that the bed, though comfortable, was situated in the entry. This could be a problem in warm weather since there are no windows there. It could be stuffy. There was no wi-fi when we were there (summer of 2011), which would have been nice. Regardless of these issues, we would rent it again for its location, view, furnishings and simple clean style." "This is the second time we have stayed here and have to agree with all the other reviewers....the accommodation is ideal for a couple, very clean, extremely well equipped with a central location and a view over the lake that we could never tire of. We have booked for next winter!" Nous avons passé un très bon séjour dans ce super petit appartement très très bien équipé ( matériel et denrées de première nécessité). La situation à Champex est idéale et la vue de la bien agréable terrasse est superbe. Nous craignions un peu la foule des vacanciers du mois d'août, mais nous avons été heureusement surpris par le caractère toujours calme,familial et convivial de Champex. Nous n'avons mis que 4 étoiles, vu la disposition de la chambre sans fenêtre où nous avons souffert de la chaleur. mais peut-être était-ce dû au fait que nous avons été malheureusement un peu malade la seconde semaine. Nous remercions Astrid et Alain pour leur accueil chaleureux et leurs deux adorables enfants. Et vive le 1er août en Suisse. Ça c'est de la fête! Magnifique vue sur le lac de cet appartement conforme à la description; Il est idéal pour deux personnes; rien ne manque pour le confort quotidien. Magnifique vue sur le lac de cet appartement conforme à la description. Le confort quotidien est absolu pour deux personnes. A noter la gentillesse particulière des propriétaires. C'était parfait même le temps ensoleillé et la température. (Text automatically translated) Access from the A9 Martigny after 25 minutes towards Col St-Bernard-out Orsières through the village, then continue up the valley Som la Proz and Champex-Lac. En été: 900 euros la quinzaine. Tarif dégressif en fonction de la durée de location. Le locataire doit prendre ses draps de lit et linge de bain. Le ménage final est à faire par le locataire. Si le locataire ne souhaite pas le faire, il sera facturé 80 euros. L'appartement est non-fumeur. Les animaux ne sont pas admis.